When light propagates in free space or in a homogeneous optical medium, its intensity profile will generally change during propagation. 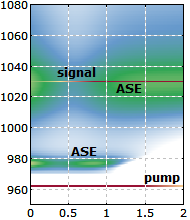 For certain electric field amplitude distributions, however, which are called modes, this is not the case: the shape of the amplitude profile remains constant, even though there may be a re-scaling of the profile, an overall change in optical phase, and possibly also a change in the total optical power. where Hn(x) is the Hermite polynomial with the non-negative integer index n. The indices n and m determine the shape of the profile in the x and y direction, respectively. The quantities w and R evolve in the z direction as described in the article on Gaussian beams. The intensity distribution of such a mode (Figure 1) has n nodes in the horizontal direction and m nodes in the vertical direction. For n = m = 0, a Gaussian beam is obtained. This mode is called the fundamental mode or axial mode, and it has the highest beam quality with an M2 factor of 1. Other Hermite–Gaussian modes with indices n and m have an M2 factor of (2n + 1) in the x direction, and (2m + 1) in the y direction. 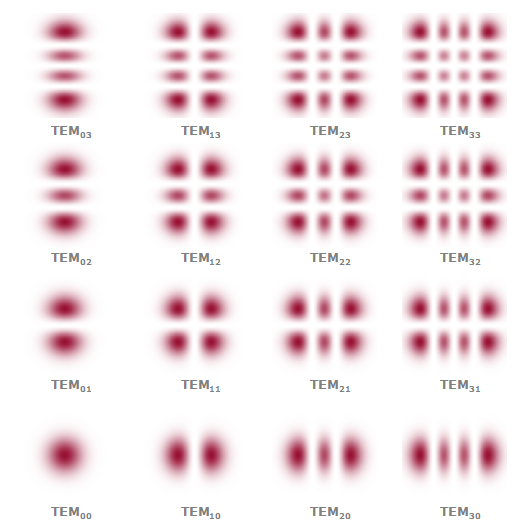 Figure 1: Intensity profiles of the lowest-order Hermite–Gaussian modes, starting with TEM00 (lower left-hand side) and going up to TEM33 (upper right-hand side). A further generalization of the equation above would allow for different mode sizes and focus positions (astigmatism) for the x and y directions. The direction of the electric field, not specified in the equation above, determines the polarization. The electric field distributions of the Hermite–Gaussian modes are a system of functions which are mutually orthogonal. Arbitrary field distributions can be decomposed into Hermite–Gaussian functions, where the amplitude content of each one is determine by an overlap integral. Hermite–Gaussian modes can often be used to represent the modes of an optical resonator, if the optical elements in the resonator only do simple changes to the phase and intensity profiles (e.g., approximately preserving parabolic phase profiles) and the paraxial approximation is satisfied. 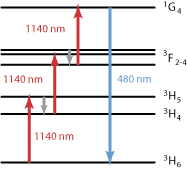 As these conditions are very often fulfilled in laser resonators, laser resonator modes are often of Hermite–Gaussian kind. If such a laser operates on a single mode, a characteristic intensity profile of the output beam as in Figure 1 can be observed. Another frequently used mode family is that of Laguerre–Gaussian modes.